January 16, 2017. 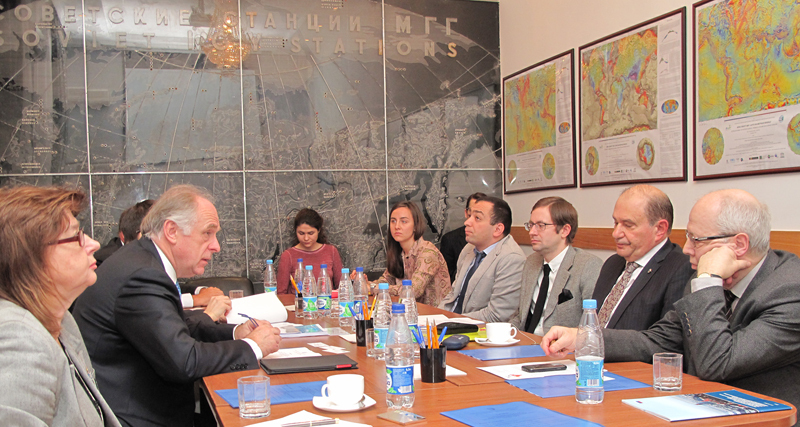 CEO and scientific director of the International Institute for Applied Systems Analysis (IIASA) Professor Pavel Kabat paid a working visit to the Geophysical Center of the Russian Academy of Sciences (GC RAS) and made a presentation on the system analysis of the Arctic region ( "IIASA Arctic Futures Initiative"). International Institute for Applied Systems Analysis is an independent international organization. It was founded in 1972 and is praised by the international community for its outstanding scientific results. Several Nobel laureates are among the scientists of IIASA. At a meeting held on January 16 in the GC RAS, participants made a number of reports. Vice-Chairman of the Scientific Council of IIASA, academician and Director of the Geophysical Center A. Gvishiani, academician and Director of the Far Eastern Geological Institute A. Khanchuk, corresponding member of the Russian Academy of Sciences, member of the European Academy, Deputy Director of the Shirshov Institute of Oceanology of the Russian Academy of Sciences L. Lobkovsky, corresponding member of the Russian Academy of Sciences and Deputy Director of the Geophysical Center A. Soloviev, leading researcher at the Institute of Geography T. Khromova took part in the meeting. Professor Pavel Kabat’s presentation titled "IIASA Arctic Futures Initiative" was devoted to the problems of the Arctic region. In particular, the author focused on the need to compound the enormous economic potential of this region to environmental protection, as well as the development of transport systems and infrastructure. Academician Alexander Khanchuk spoke about the fundamental study — the Arctic Program of the Russian Academy of Sciences. Corresponding member of RAS Leopold Lobkovsky delivered a presentation on a geological model of Lomonosov and Mendeleev ridges and a project to change the boundaries of the Russian shelf in the Arctic region. Researchers of the Geophysical Center — A. Rybkina, R. Krasnoperov, B. Dzeboev actively participated in the discussion and delivered their presentations. A few days earlier Director of IIASA Professor Pavel Kabat visited the Gaidar Forum, held from 12 to 14 January in Moscow. His visit was highly appreciated by the Russian scientific community, the diplomatic community and the media.